Why can't I hear vocal tubes? Hi there. I've encountered an issue where an author will send me a Reaper file in which I want to create and pitch the vocals... yet, for whatever reason, I cannot hear the MIDI tubes I create. I've double-checked the normal stuff: what's muted, what's soloed, and the volume of the part (in this case, TRACK VOCALS). Pressing play yields no audio from the MIDI tubes, nor does holding them down to preview the pitch. Yet, inexplicably, HARM1 is working fine in this particular Reaper file... but there have been other times when none of the parts let me hear them. Any idea what in tarnation is going on? And he can play it back just fine? Is the FX enabled? Personally, I like to add ReaSynth to the main PART VOCALS as well as each of the HARM parts, then mute the tracks I'm not working on. The template's way of only adding FX to PART VOCALS is a little buggy. Edit: To clarify, copy both of the FX attached to PART VOCALS and paste them to each of the HARM tracks' FX. Our template doesn't have an FX attached to PART VOCALS? It's gotta be your FX settings. Try enabling a different VST like MC44, that's the one I use to chart vocals, its more accurate*** than reasynth especially on higher tones. Hey, hey, this was the issue. I do not have the MC44 effect plugin (but I found it online), so when I'd try to hear the tubes, it wouldn't play. When I clicked the FX button and check-boxed the other two options, the issue was solved. I'd never had to bother with these settings before, so sorry for my ignorance. Thanks for your help. The plug-in that was added to the C3 templates is awful, the worst thing ever. The original plug-in is what anyone should use because it's the closest to the human voice, regardless of how bad it sounds compared to a piano or a clean synth plug-in. I swear, every single person who sent me tracks to check had errors they could not hear with this artificial plug-in. Yeah I stopped using it quite a while back. The main drawback I found was that it does not handle tuning cents, like at all. Probably 1 in 5 songs that I've authored vocals for require some fine tuning to get the pitch as close as possible, and you cannot do this with MC44. Stick with the built in one. Stick with the built in one. Are you referring to ReaSynth? 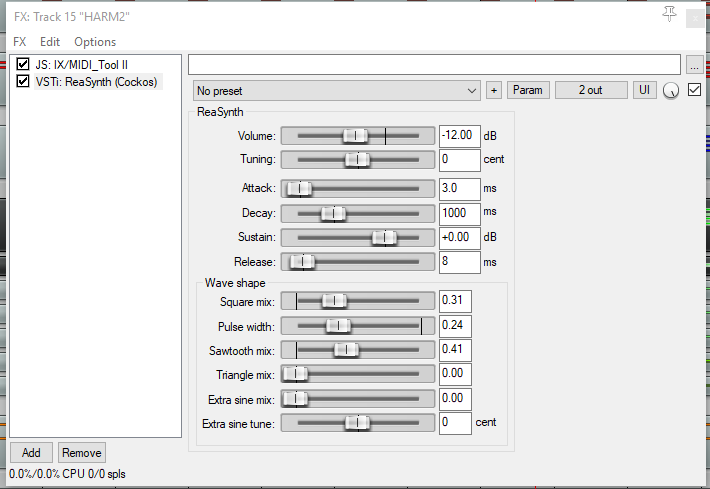 That's the only one I see in the C3 template coupled with Midi_Tool II. Now I feel like I'm missing out on something. Yes that's the one. A wise man shared these settings with me, this gives you a slight 'kazoo' sound to the tone. This part is CRITICAL and you should do it before you chart any vocal tubes. 1. Now then I find the quickest way to get an idea of what your tuning cents will be - is to try to chart a riff from the song using the actual notes, like you're charting the pro-keys or what the pro-guitar would be. Just a couple measures will do. 2. Next I select the range of the riff, and click 'loop playback'. Now you should hear the riff you charted playing back on a loop. 3. Now open up the VST controls for reasynt - change the tuning to 30 cents. It's going to sound different - now its up to you, is this closer to the song's actual tone? Try 15. Try 45. One of those will sound better. Fine tune in increments of 5 or 10. Most often, the tuning cents required is 0. About 20-25% of the songs I've done require this tuning, so for me that's around 70 customs. I suspect that number is actually higher, and as I go over my older stuff I'm finding a bunch that I missed. This is very important, if the tuning cents are out the singer will never be able to enjoy the song or get a decent score. How do you know if a note is on pitch? You just play the tune and make sure that no notes are off key. But that doesn't mean the MIDI notes are spot on the notes the singer is singing. For that you need to play the song in the background, low volume, with the MIDI notes on top. You need to be able to hear the background song enough to notice pitches but not so much that the MIDI notes disappear to the point that you don't notice discrepancies. Now, if your MIDI notes are very artificial, you will have a hard time comparing song and MIDI track, that's why you should use a voice-like FX and absolutely not something that sounds like a piano or a clean synth. Sure, they sound cool by themselves but they are absolutely useless in determing pitches in songs where the singer is not singing in a very clear timbre. This is important for simple pitches but it's even more important for the tuning cents work that Prez outlined. Yup. I do all that. Thought there was a plug-in that I should have been using instead. Glad to see confirmation of process. Thanks!